This is my review of the Minecraft Enderman stuffed animal toy from Jinx. A toy I’ve really fallen in love with. It’s one of the Minecraft toys enderman love (of course they would, it’s of them! ), and your kids will love it too! Here are some of my thoughts on the toy before we get into the information. This is my favorite enemy plush from Minecraft. They kept it simple. It’s not overly detailed and it has a few nice spots of embroidering. The proportions make it look cute. I think other toy manufacturers should look to this toy to learn how to do it right. Although this toy is a little on the smaller side, it’s much better than the larger one. It just has a fantastic look to it. I think if you only had the money to buy one plush toy from Minecraft, this should be the one you get. The Minecraft Enderman toy – Don’t look? It’s okay to take a gander at many of the creatures in Minecraft, most of the time. It’s a big ol’ world with plenty of things to see and do. After all, part of Minecraft’s charm is its mysteriousness. I’d say exploration is one of the biggest features of the popular block building game. But, there’s one creature you DO NOT want to find yourself in a staring contest with. I’m sure you’ll come across him in your travels, even if you try to avoid him. It’s the towering, yet skittish enderman. You can’t look at them directly, so peripheral vision is the only way to get a glimpse of the shy critter. Because if you focus on him, bad things happen. First, the enderman will let you know he isn’t pleased with his voice. A low rumbling growl quickly turns into a loud, but still deep, scary uproar. It’s almost like a yell, but more threatening and it has a creepy vibe to it. Startling to say the least, especially when you’re in total isolation, deep down in a dark mine shaft. I can’t tell you how many times I was listening to music and relaxing while playing the game. Mining for some diamonds doesn’t take a lot of brain power. All of a sudden I hear the scream of an enderman and it makes me jump every time. Even though I know it’s a game, for some reason I look around my room to make sure nothing is there. Secondly, the enderman will start to shake violently and he’ll grow into a boiling rage. They may be shy but, when they get angry, that all goes out the window. Luckily the stuffed animal won’t be upset if you look at him. Already know you want the plushie? 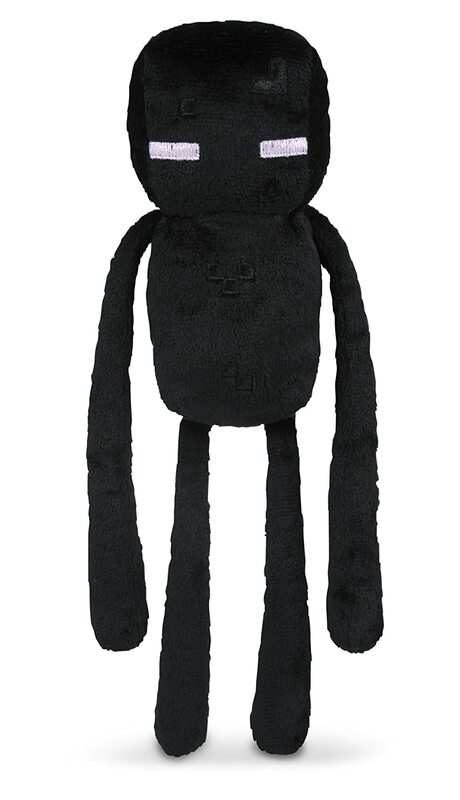 Buy the Minecraft Enderman Plush Toy here! Does he look like an enderman? Well, of course, it looks like an enderman. It wouldn’t be a Minecraft enderman stuffed animal if it didn’t look like one right? But, what does an enderman look like? Tall, black like the void, and slender. Many people believe, including me, that the enderman is based on the creature from folklore called Slenderman. Similar to Bigfoot, Slenderman is a (fictional?) character that few have ever seen. He is colossal but slender, and supposedly stalks people at night. Creepy. It’s not difficult to believe since the name slENDERMAN is similar to enderman in addition to the visual similarities. The main difference between this plush toy and the enderman from Minecraft is the lack of purple pupils and the toy’s cute aesthetic. The enderman’s design has been simplified to give the toy a cute, cuddly, and fun look. No pupils, rounded body, it’s arms get slightly larger towards its hands. The plush also has embroidering to give it a pixelated look just like Minecraft. The simplified look makes this the best enderman plush. It’s a small toy packed full of fun. The plush is 7″ tall. So, while he won’t tower over you, the proportions are still correct so he has long thin legs and arms. While the plush toy doesn’t have any specific things it can do, an enderman does. So, there’s plenty of room to use your imagination for play. I’ve seen people use him as a travel companion. Taking pictures of him doing things on their vacations. It was cute. That’s an activity that really makes this toy come alive for a kid’s imagination. The resulting pictures are really fun to look at too. Once the enderman is after you, it’s tough to get away since it has the ability to teleport. Be careful, if you think you got away from an enderman, after running away it’ll appear right in front of you to continue the chase. He leaves a purple teleportation effect in his wake which makes him slightly easier to track. Almost like purple snowflakes radiating from him. But, you’ll need some good weapons and armor to fight him because he does a bit of damage. The plush toy won’t hurt you of course. Besides, it’s too soft and huggable. But, if you’re looking to get away from an enderman there’s a trick to do it. Water. Endermen hate water. They get hurt when water touches their skin. It’s funny to see an enderman teleport all over the place during a storm. He’ll keep teleporting until he finds shelter under a tree or in a cave. You can always drop a bucket of water at your feet and it won’t be able to touch you. This plush toy is surface wash only so it’s fitting that enderman are afraid of water. They also love to steal things. They take blocks all the time, usually grass blocks. But, sometimes it’s part of your base! It’s easy to see how lots of tomfoolery and mischief can happen with a kid’s imagination and Minecraft enderman toys. It can be very annoying when I’m working on something and I see a few blocks missing. I know those dirty enderman are back at it again. I feel like I’m yelling at kids to get off my lawn. I would tell you about the box, but there isn’t one. Plushies typically don’t get boxes. It’s surprising when they do. He just has an official tag that lets you know it’s a series one Minecraft toy. There are several Minecraft plushies that do come in a box though. One of those is the Minecraft zombie plush toy. There are a lot of Minecraft plush toys so that makes this plush very collectible. There are a few different enderman Minecraft toys. So, if you’re not too thrilled about a 7″ stuffed animal, there’s a 17″ one. Although, I like the 7″ toy better. It has a more cute look to it by comparison. Other Minecraft plush toys include a rabbit, zombie horse, cat, baby wolf, villager, slime, normal horse, snow golem, witch, baby pig, baby zombie, chicken, creeper, zombie pigman, sheep, wolf, mooshroom, pig, ocelot, zombie, skeleton, iron golem, cow, bat, baby sheep, ghast, spider, ender dragon, baby ocelot, and squid. Big list huh? The 7″ Minecraft stuffed enderman plush is a wonderful toy. It has a cute aesthetic that gives the feel of an enderman very well. It’s not an exact match but, I love it. It’s soft, durable, and well made with plenty more plushies where that came from. Exactly what I want in a plush toy. I’d highly recommend the Minecraft enderman stuffed animal for your younger Minecraft fans and plush toy collectors. Buy the 7″ Enderman Plush Here!